These creepy cupcakes are the perfect snack for a Halloween Party or just for enjoying while lazing on the couch in your pjs watching a horror movie. Depends on what type of person you are (I happen to be the latter). For a really Halloween-y look, I suggest dying the batter orange or green, which would look awesome with dark chocolate chips. I had planned to do this, however I realised halfway through the process that I had no orange food colouring. As you can see from the photo below and the batter’s greyish corpse-like colour , my dye-it-purple-instead backup plan failed miserably. That being said, they still tasted delicious! Preheat oven to 180’C / 350’F. Beat butter and sugar together until smooth. Beat in eggs and flour. Add vanilla essence, chocolate chips and food colouring. Mix well and spoon the mixture into the paper cases. Bake for 15-20 min and leave to cool. 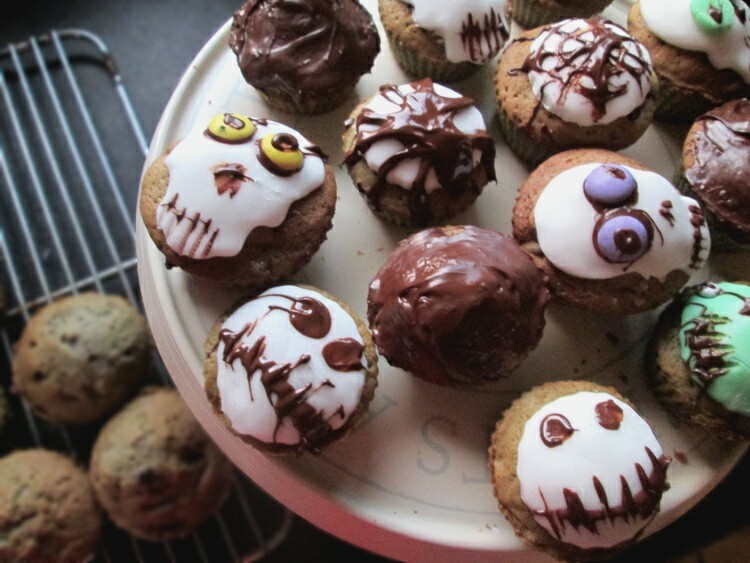 Decorate with skulls, monsters, spiders and cobwebs using fondant icing and melted chocolate.